Health First Network - Can gut health affect how we experience pain? Can gut health affect how we experience pain? Nagging joint pain, the burn of arthritis, and even low-grade pain don’t necessarily start from where the pain is felt. Yes, that arthritic pain can develop due to mechanical reasons, like wear and tear on the joints. But new research has found that inflammation and the sensation of pain can actually come from the gut. Gut feelings, indeed. Each day, you eat food, and your gut’s responsibility is to turn it into nutrients that your body needs to function. Although your gut seems like it’s on the very inside of your body, think of it as the material that separates your insides from your outsides. You’d think that with such an important job, your gut would be thick like a fortress around a castle, but your gut lining is only one cell thick and very vulnerable to injury. On this thin lining clings a layer of gut bacteria that helps to reinforce the gut lining. They’re like little soldiers guarding a fortress. But factors like stress, consuming food and drink that irritate your gut, and antibiotics can all wear away the bacteria, leading to an imbalance of bacteria commonly called dysbiosis. When bacteria are out of balance, and when gut bacteria disappear in numbers, the gut lining is left exposed. And eventually, after enough irritation, the gut lining can’t hold it together any longer, and intestinal permeability, or “leaky gut” is born. Leaky gut is just as it sounds – a leaky gut can allow foreign materials to “leak” through the gut into the bloodstream, where they don’t belong. Although conventional medicine used to laugh it off, leaky gut is now becoming known as a mechanism for all sorts of health conditions – including pain. Researchers in the Netherlands found a link between osteoarthritis (particularly in the knees) and leaky gut caused by obesity (1). Many links between rheumatoid arthritis and leaky gut have been found. Several studies have shown that when leaky gut is simulated, i.e. small amounts of parts of the microbial membrane called endotoxins are put directly into the bloodstream, it creates low-grade, body-wide pain (2). Chronic fatigue syndrome and fibromyalgia have been found alongside leaky gut and dysbiosis. Beyond pain, leaky gut has been observed alongside allergic diseases, obesity, type 2 diabetes, cardiovascular disease, depression and neurobehavioral disorders. Researchers at Cornell University are using a model of the gut to study the link between the gut and pain even further. Knowing what we now know about where a lot of pain originates, it would make sense that many of the options for pain relief are missing the mark. Conventional treatments (i.e. medication), although helpful for relieving pain, are like pain band-aids. They can help to reduce the sensation of pain, but won’t help to treat the root cause of the pain. Not to mention, they can be hard on the body, especially the gut – non-steroidal anti-inflammatory drugs (NSAIDs) have been linked to leaky gut, and many conventional pain relief products come with a long list of side effects. So how do you treat pain that originates in your gut? With a two-pronged approach that heals the gut and works quickly to extinguish pain! Genuine Health’s line of fast, all natural pain relief products are all made from BiovaFlex® natural eggshell membrane that works in just 5 days to reduce inflammation, relieve joint pain and increase mobility. Additionally, natural eggshell membrane has been found to reduce inflammation in the gut, reduce intestinal permeability, and can prevent dysbiosis (3). NEW fast joint care+ with fermented turmeric is made with the amazing combination of gut-loving BiovaFlex® natural eggshell membrane and fermented organic turmeric, which work to reduce two pathways of pain and inflammation. Plus, the fermentation process can help shift gut bacterial populations in healthy ways. Can your conventional pain reliever do all that? Pain happens. And the best protocols for managing it deal with the root cause, which is in many cases, the gut! 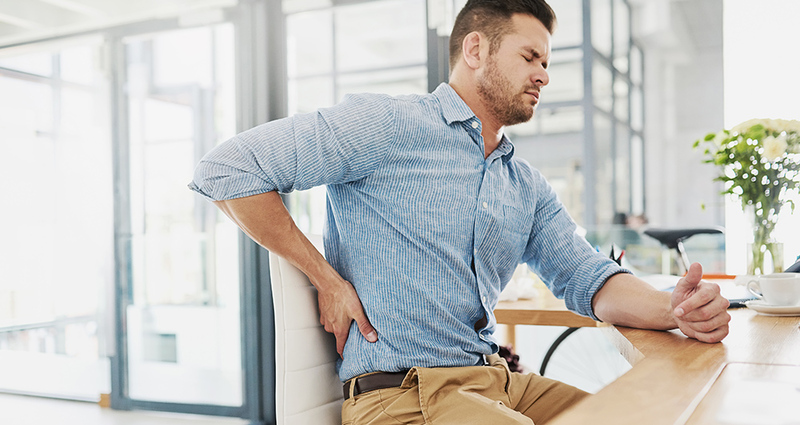 By taking a two-pronged approach to treating pain, you can help to not only manage the symptoms of pain, starting with the gut. 1. Boer CG, et al. Paper #4. Presented at: Osteoarthritis Research Society International World Congress; April 27-30, 2017; Las Vegas. 2. Reichenberg A, et al. Cytokine-associated emotional and cognitive disturbances in humans. Arch Gen Psychiatry. 2001 May;58(5):445-52. 3. Jia H, et al. Eggshell membrane powder ameliorates intestinal inflammation by facilitating the restitution of epithelial injury and alleviating microbial dysbiosis. Sci Rep. 2017 Mar 8;7:43993. doi: 10.1038/srep43993.